We had a good breakfast in the hotel and then went on a city tour on the bus. Our first stop was Montjuic. 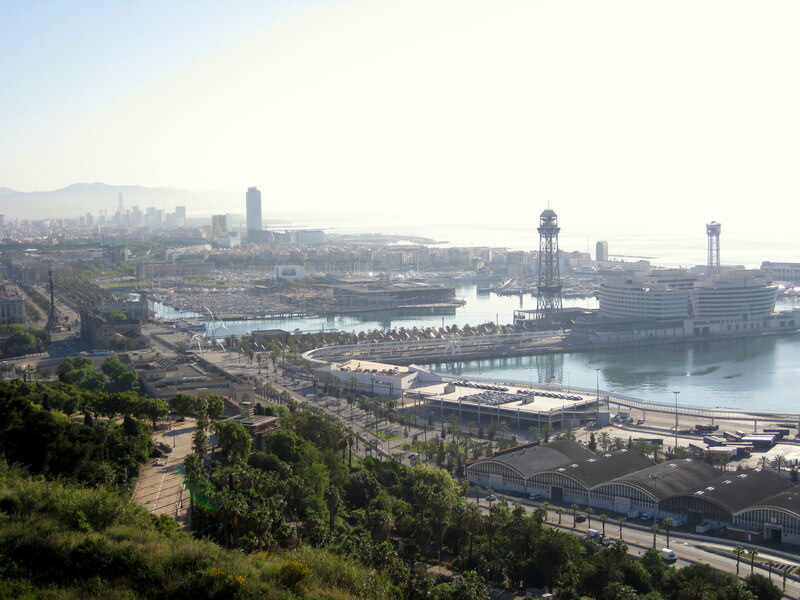 Several thousand years ago, Iberic Celts settled on the Montjuïc, a 700 ft high hill so utheast of Barcelona's current city center. The hill was later used by the Romans as a ceremonial place. Today the hill features a large number of sights and attractions, most of them originating from the 1929 International Exhibition and the 1992 Olympics. We drove by the National Palace which was the central pavilion of the International Exhibition. This building, in neo-baroque style, is home to the Museu Nacional d'Art de Catalunya. We also drove by the Olympic Stadium. The exterior dates from 1929 but the interior was completely rebuilt for the 1992 Olympics. Near the Olympic Stadium is the Olympic Tower, which is very modern and can be seen from some distance. It was the main communication tower for the coverage of the Olympic Games. We did stop in one of the parks. 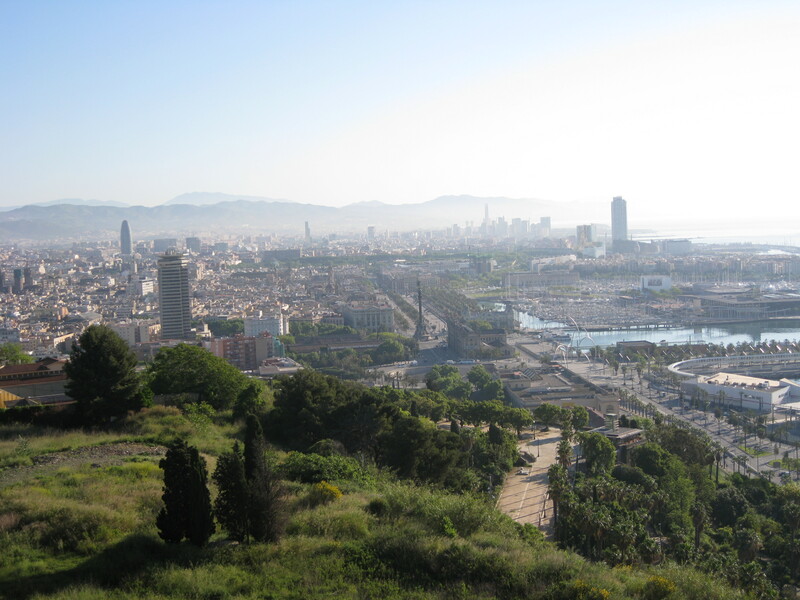 It was a beautiful day and the view of Barcelona and the Mediterranean was spectacular. I took a lot of pictures. The next stop was the old Gothic Cathedral. 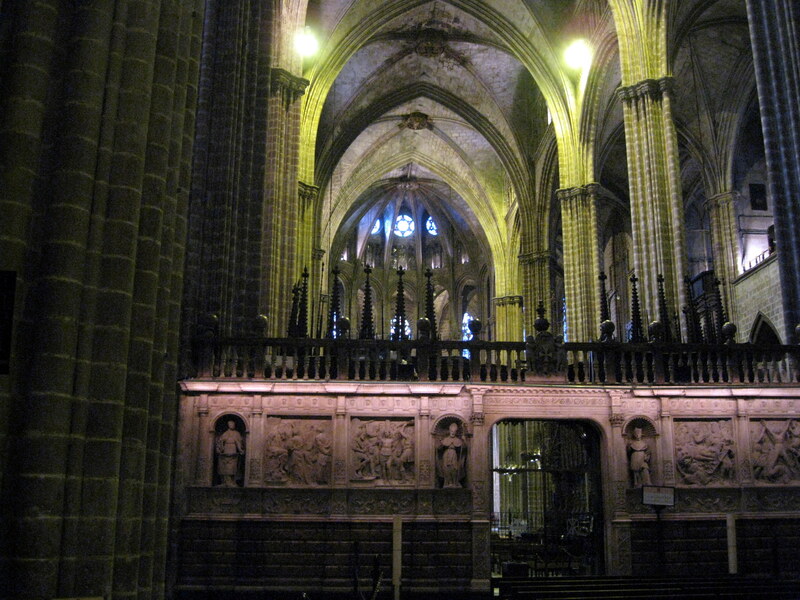 Barcelona’s cathedral is an outstanding example of Catalan Gothic architecture. Its spires can be seen from almost all over the Gothic Quarter, and the large square upon which it is located, the Plaça de la Seu, is one of the neighborhood's main thoroughfares. 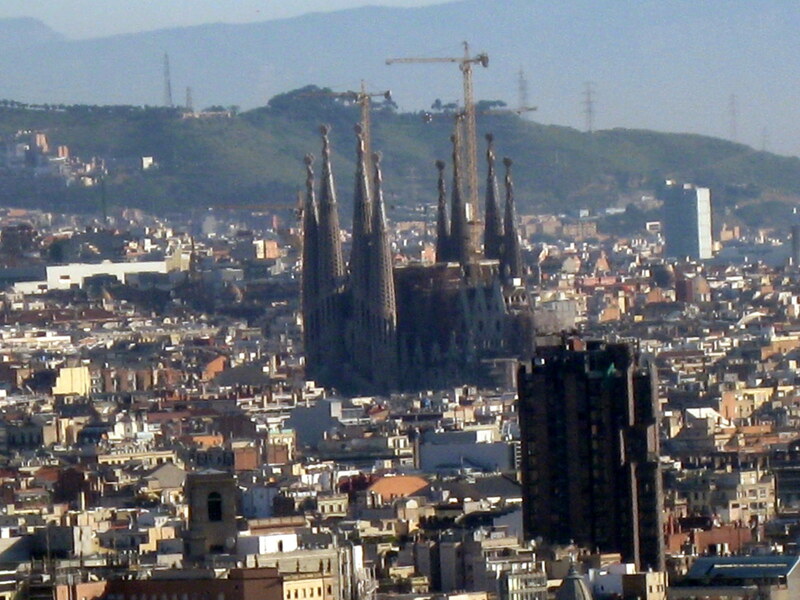 The elevated site has always been Barcelona's center of worship. Before the present cathedral, there was a Roman temple and later a mosque. 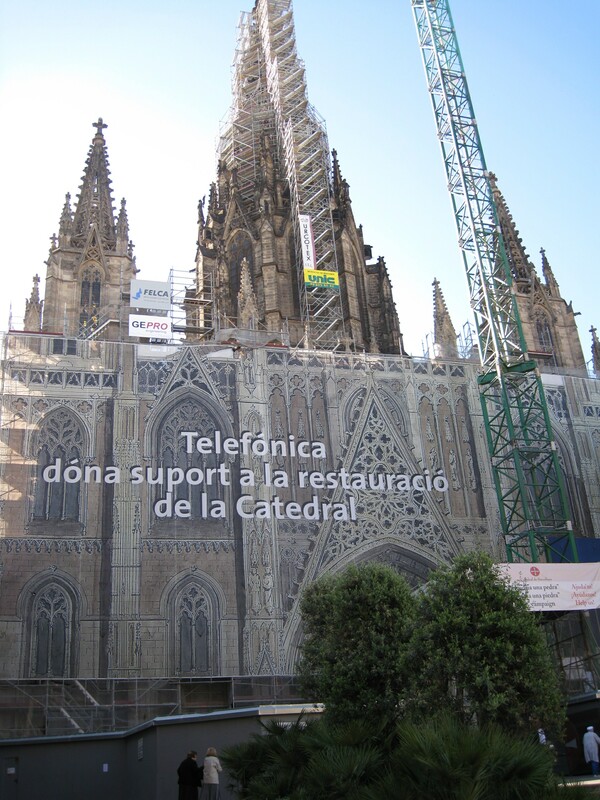 Construction on the cathedral began at the end of the 13th century, under th e reign of Jaume II. 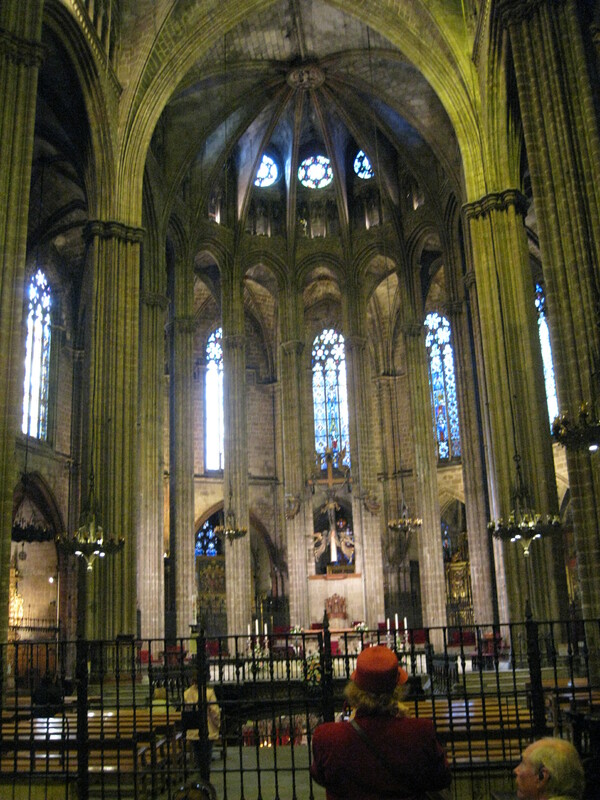 The bishops of the time ordered a wide, single nave, 28-side chapels, and an apse with an ambulatory behind a high altar. Work was finally completed in the mid-15th century. The west facade dates from the 19th century. 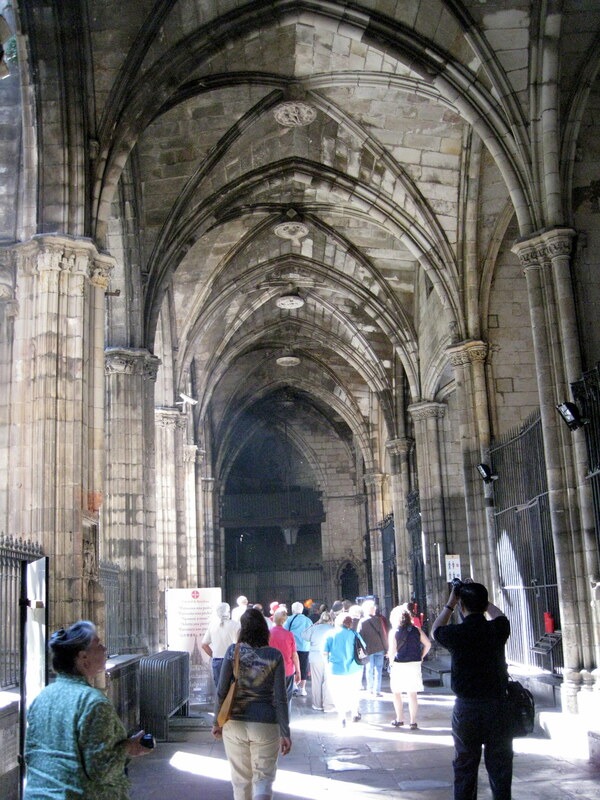 Again as we have seen in Burgos and Saragossa, the choir was in the center of the nave with no center aisle running from the front door to the high altar. 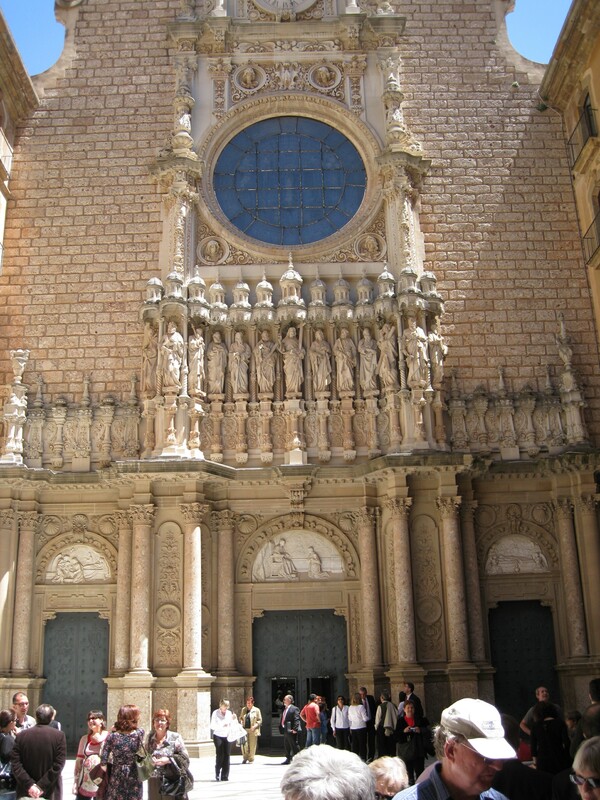 The most interesting chapel is the Cappella de Sant Benet, behind the altar with its magnificent 15th-century crucifixion by Bernat Martorell. 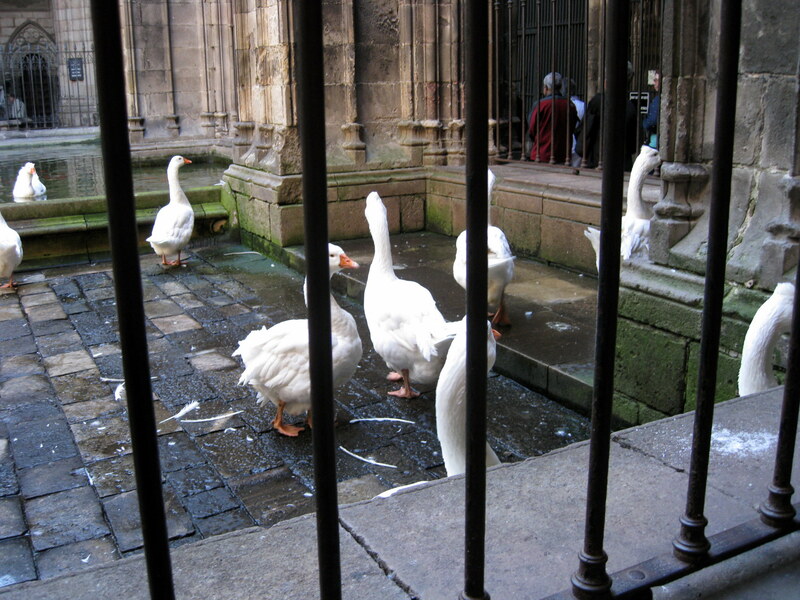 The cloister, consisting of vaulted galleries with iron grilles, is filled with orange, medlar, and palm trees and features a mossy central pond and fountain, and is home to a gaggle of white geese. The central bell tower was surrounded by scaffolding for some major repair as was the west façade. The top of the tower has a stature of Santa Eulàlia, the co-patroness of the city. The martyr, allegedly a virgin daughter of a well-to-do Barcelona family, was burned at the stake by the Roman governor for refusing to renounce her Christian beliefs. Then back on the bus to my much awaited visit to Sagrada Familia. (The photo on the left is Sagrada Familia from Montjuic with telephoto lens) Before our trip, I had made a model of this church (SEE MODEL). The model was taken from drawings of what the finished church was to look like. I had taken pictures of my model and brought them with me to compare. The bus stopped on the Nativity side (the south side). Sagrada Familia (Holy Family Church) by Gaudi was begun in 1882 and was incomplete at the architect's death in 1926. He died after being struck by a tram. 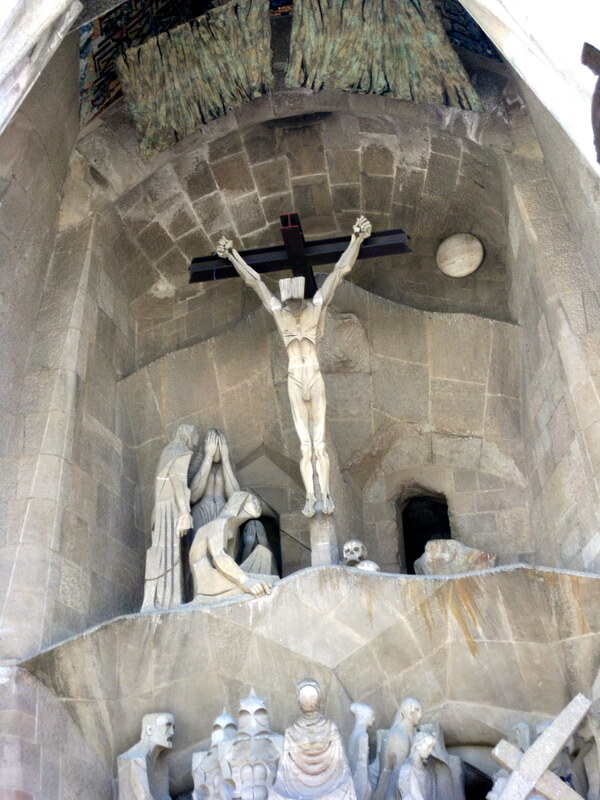 The Sagrada Família became Gaudi’s all-encompassing obsession toward the last years of this intensely religious man's life. It is estimated that it will take at least 20 more years to finish. In 1936, anarchists attacked the church destroying the plans and models Gaudí had left behind. The present architects, aided by modern technology, are working from photographs of those models. The central nave is starting to take shape and the Glory Façade, which is the west end, still has a long way to go. This façade will contain the words of the Creed. There is a tremendous amount of symbolism on the outside and inside of Holy Family. 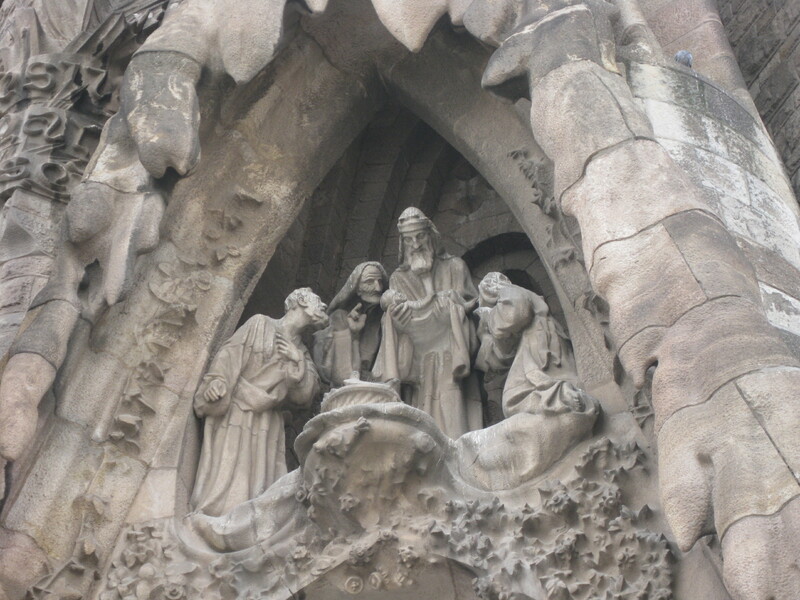 The Sagrada Família was conceived to be a "catechism in stone." The basic design followed that of a Gothic church, with transepts, aisles, and a central nave. There are to be twelve towers -329 ft. high, four on each of three sides. The north and south set of towers are complete. These towers will represent the twelve apostles. Four more towers representing the evangelists will someday rise from the crossing. Finally there will be a center tower representing Christ and another tower for Mary rising from the apse. Some work is presenting being done on that tower. The North façade (the Nativity Façade) and the South façade (the Passion Façade) are complete. 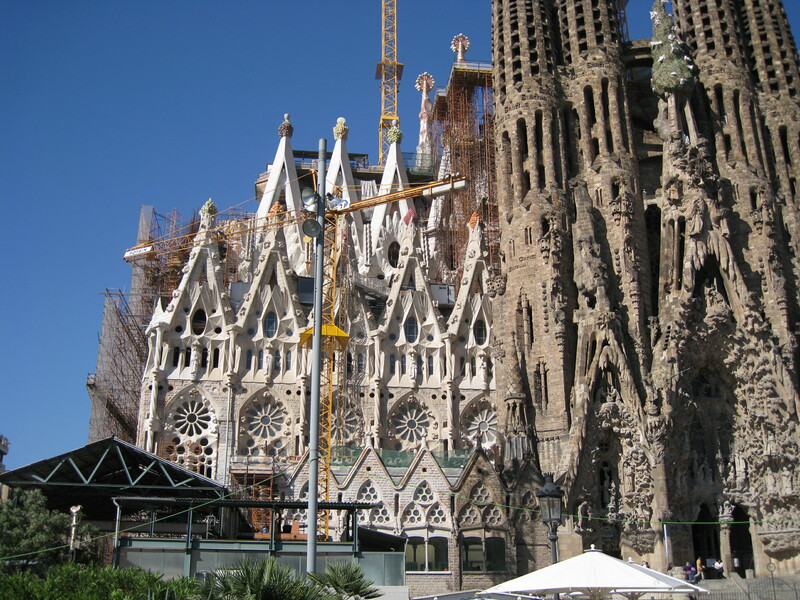 The Nativity Façade is the oldest, and the only one to be completed while Gaudi was alive. The work represents the birth of Jesus; its entire expanse is filled with figures of the Holy Family, flute-bearing angels, and an abundance of flora and fauna. Nature was Gaudi’s passion; he spent hours studying its forms in the countryside of his native Reus, south of Barcelona, and much of his work is inspired by nature. On the Nativity facade, he added birds, mushrooms, even a tortoise to in keeping with the rest of the religious imagery. The central piece is the "Tree of Life," a Cyprus tree scattered with nesting white doves. Time did not permit us to go inside. We intended to do that when we return to Barcelona next week. More pictures of the exterior and photo of the interior will be written about on Day 16. We did walk around the entire outside. There were hundreds of people on the sidewalks, most standing in long lines to buy entrance tickets. We stopped to look at a sign about the hours and lost our group in the crowd. We went the wrong direction for a while. Finally we turned around and found the bus across the street. They were waiting for us. I think they might have gone off without us. The bus then dropped off near the hotel those, who were not going on the optional trip to Montserrat. Optional trips always cost an extra fee. We continued on for this wonderful trip. We could see this mountain as we approached it. 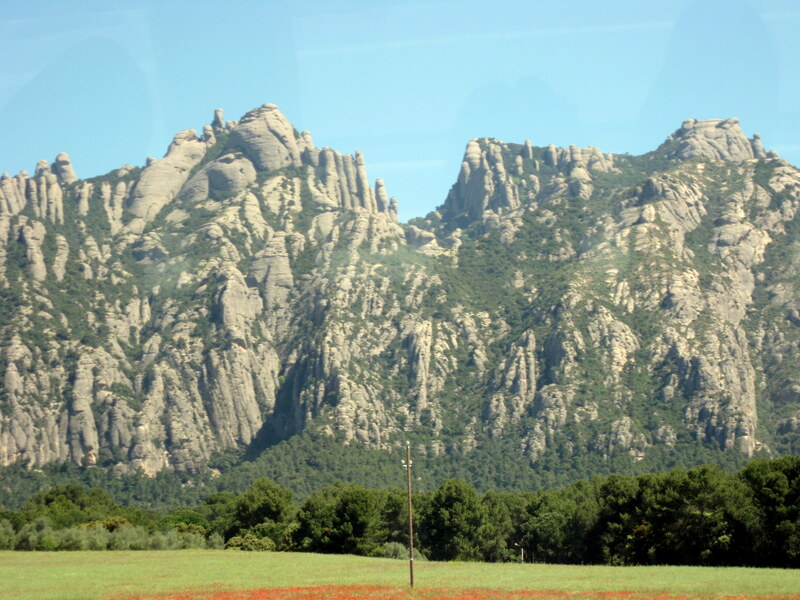 The name Montserrat is a Catalan word for “sawed mountain”. Some say that it is reminiscent of the tooth blade of a saw. The poet Verdaguer envisaged the mountain as something sawn by angels. 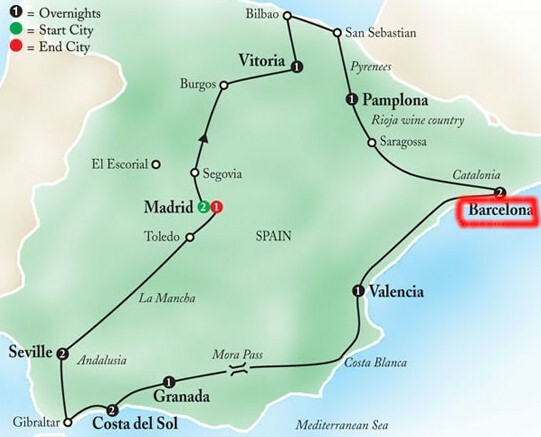 It is located about 18 miles from Barcelona. It is 9 miles wide at its widest point. It reaches a height of over 4,000 ft. There is some evidence that hermits inhabited the mountain in the later part of the ninth century. In the first third of the eleventh century the Abbot-bishop Oliba founded a small monastery which grew rapidly because of claims of miracles performed there by the Blessed Virgin. Between the twelfth and thirteenth centuries a Romanesque sculpture of the black virgin was discovered. This statue is still venerated today. 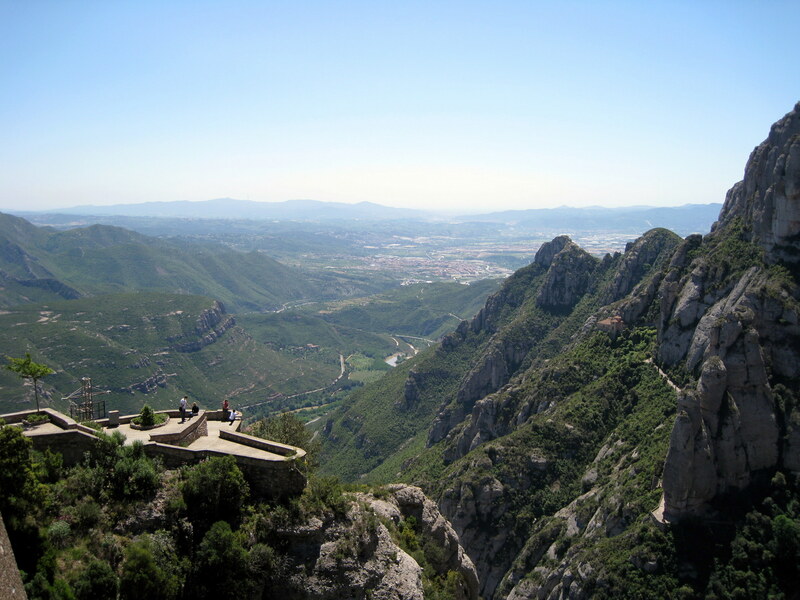 At one time there were over one hundred and fifty churches dedicated to the Madonna of Montserrat and pilgrims came from all over the word to view her. Our bus climbed and climbed the narrow, winding road to the top. It was a breath taking view at all stages of the ascent. The bus dropped us off in the parking area. Next to the parking area was a rather new building that contained a café that served sandwiches and salads on the first floor. There was a nice balcony attached that over loo ked the valley below. Downstairs was a full cafeteria which served more substantial meals. We ate in the café. The group assembled again and our leader took us to the Royal Basilica. It was a beautiful church. 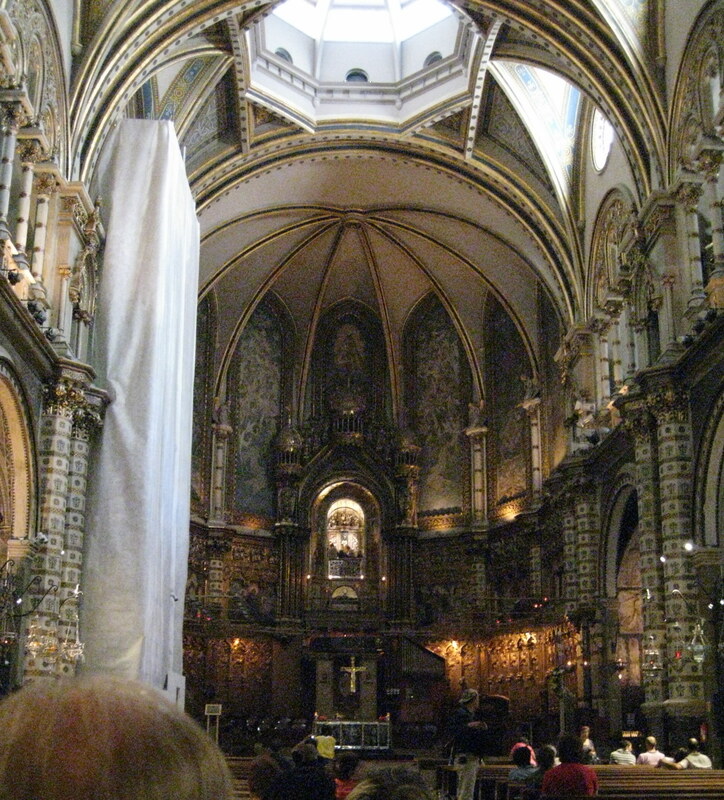 There was a passageway that led to space above the high altar. In it was the Madonna of Montserrat. 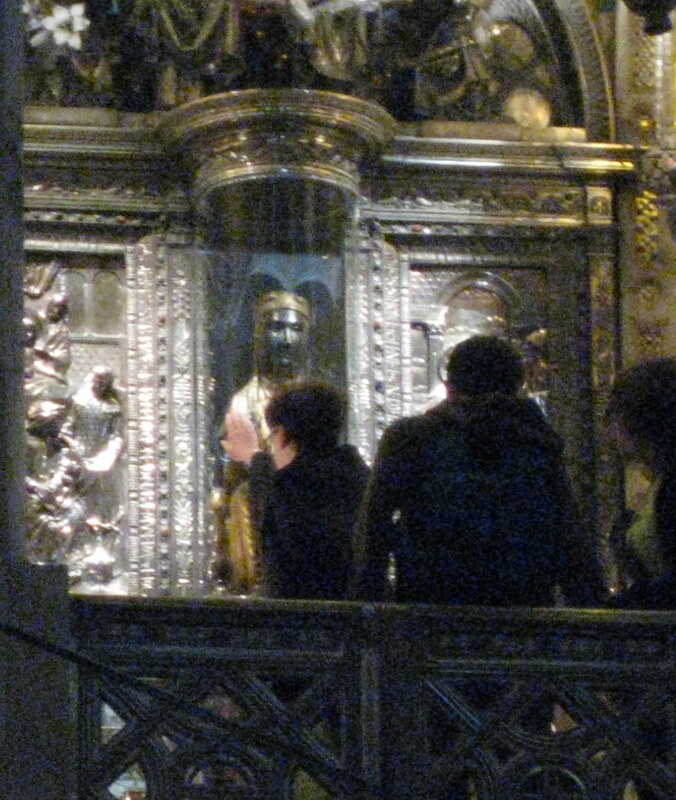 There was a side entrance to the church – with a very long line – that leads directly to the Madonna. People could walk by and see her. She was in a glass case with only her right hand holding a small orb which is extended through a hole in the glass case. People pass by and touch the orb. The line was too long for us to go in. We went back to the hotel and walked around the area looking for a nice “bar”. We did buy our grandson a FC Barcelona shirt and pants by UNICEF. We sort of got lost in the gothic area but soon found our way back to the hotel for a drink in their bar. Before we left home, we had made reservations at restaurant called La Dama. It was within walking distance of our hotel but we decided to take a taxi. We had an interesting driver. He was an older man who discussed – in English – Gaudi and Kafka. He was very knowledgeable. The building which housed the restaurant was of the Gaudi style. A doorman met us at the front door and took us up a flight of stairs. He rang a door bell, and we were greeted by three men. 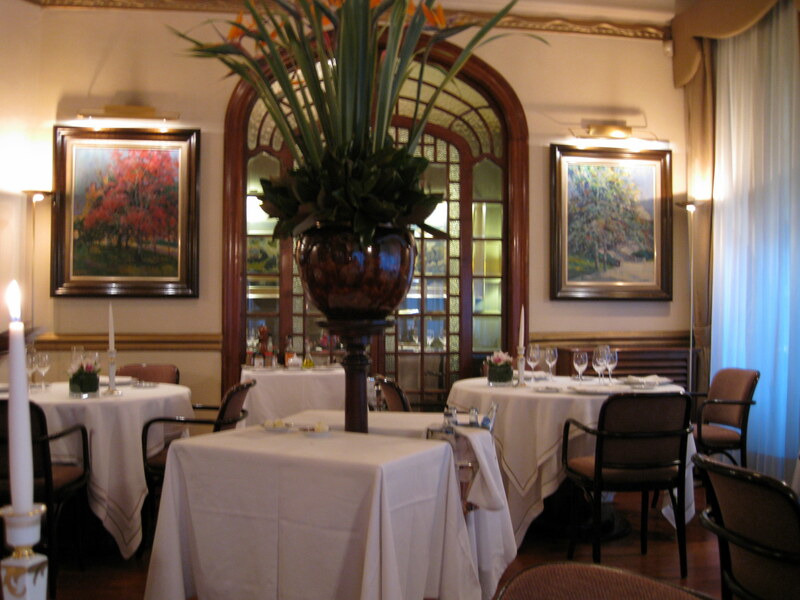 The restaurant consisted of two rooms with four or five table in each room. We were the only people in the restaurant. When we were about half through with dinner another party of three came in and were seated in our room. Later another couple arrived and were seated in the other room. We had excellent service….all three servers waiting on us. We began with Jack Daniels – Jim Beam is not always available in Europe and my wife had cava. For starters we had tiny croquette chips and calamari. Then they served us a small amuse bouché. The first course was salmon croquettes carpacio, then vegetables and crispy ham (wonderful). Next was the fish course after which they served some sorbet followed by duck (quack,quack). We drank young Catalyn wine to start – white then a big rich heavy white. Then we had a mid level red. It was a lovely meal – very expensive – but worth every penny (dollar). We decided we would enjoy a walk “home”. It took a little while but we made it. We were cautious because we expected, and hoped, that Barcelona would be in the finals of the UEFA (Union of European Football Association) championship. Barcelona was in the soccer semi finals. Their place was guaranteed if Madrid looses tonight. Well Madrid lost and the town went wild. Our room was on the front of the hotel overlooking the Ramblas. 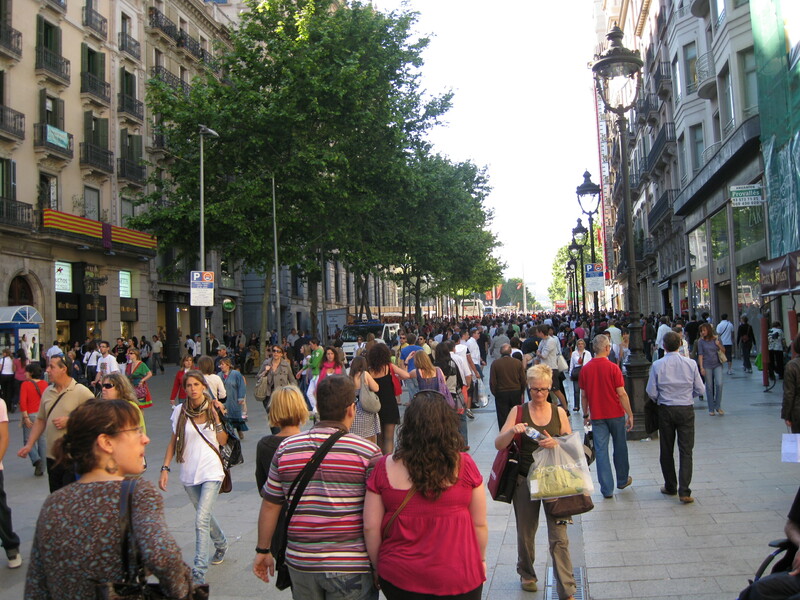 Droves and droves of people wandered up the Ramblas heading to Plaza Catalunya for the celebration. There were all kinds of horns and fireworks and other noises. It went on until about 3:00 am when the police started using tear gas. By that time the crowds were well “drunk” and rather rowdy. If we had not known what was going on, it would have appeared to have been a riot or some type of a terrorist attack.